Just a fifteen minute walk east of Amsterdam Central Station is the science centre and museum NEMO. The museum’s origin dates back to 1932 and is currently housed in a striking green building that is hard to miss on the River IJ. The building which looks like the hull of a ship was designed in 1997, and like many notable buildings in the Netherlands, NEMO was opened by Queen Beatrix herself. NEMO is spread over five floors where hands-on science and technology exhibitions that are fun and educational for the whole family are offered. The museum’s fifth floor features a cafeteria and a children’s play area, while the upper deck offers splendid views of the surrounding city. 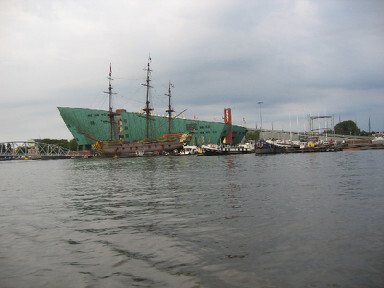 The NEMO science centre and museum is one of several attractions located on the Oosterdok. Other attractions in the area include Het Scheepvaartmuseum (The National Maritime Museum), housed in a former naval storehouse near NEMO. The Scheepvaartmuseum, which relocated to its current location on Kattenburgerplein in 1973, allows visitors to discover 500 years of maritime history through various enticing tours and exhibitions. There is even a special exhibition for children! If nautical activities are your thing, then you might want to keep your eyes open for SAIL Amsterdam. This large maritime event takes place every five years, whereby tall ships from around the world are welcomed into the city, docking in Amsterdam’s eastern harbor. The next SAIL event takes place in August 2015 and is open to the public to visit for free. The Oosterdokseiland (Eastern Dock Island) was created in 1832 by damming it off from the River IJ. The area around it has seen a lot of change over the years. The island can be accessed by foot from both Prins Hendrikkade and Amsterdam Central Station. Walking along the Prins Hendrikkade towards NEMO you will pass several boats and buildings near the water. Another prominent location on the River IJ is Sea Palace, which is the first floating restaurant to open in Europe. The building has a typical Chinese temple design with a green glazed roof and has been floating on the IJ since 1984. Here you can expect to feast on traditional Chinese fare for a pretty penny. Other restaurants in the area with a difference include the Tricky Theater, a bar, restaurant and theater on a boat! The kitchen is open Monday to Saturday from 4pm, and complementing the food and drink is a range of entertainment from mime to illusionist performances. This is truly an experience. The newest and hottest place where local Amsterdammer’s like to hangout when the sun is out and/or work is over is at Hannekes Boom. The location dating back to 1662 was reopened in 2011 and is one of Amsterdam’s hidden treasures located across the IJ from NEMO. This rustic hideaway not only offers fantastic views of the IJ but a funky, bohemian yet trendy ambiance. Hannekes Boom is inspired by the original structure that was located at the very spot. It is made up of salvaged and recycled materials, giving it an arty vibe. When the sun is shining you can expect packed terraces of people from all walks of life enjoying a few beers or a BBQ . Pull up by boat for lunch or dinner. A great place to get an alternative feel of the city. The area also offers a wide selection of hotels and apartments in the area to suit different budgets. Please click here to find accommodation that fits your needs. NEMO is a stone's throw away from Amsterdam Central Station and is easily reached on foot. You can also take bus 22 from outside Central station .